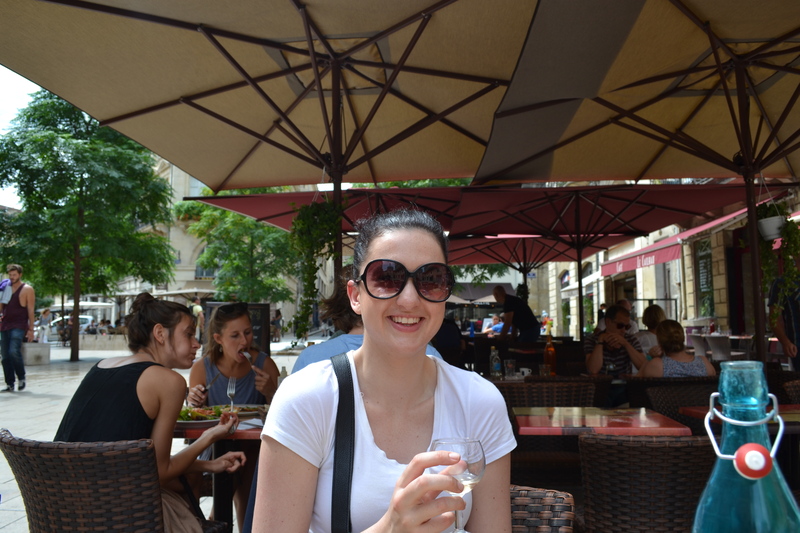 After getting off the TGV in Bordeaux we easily found our hotel as it was right across the road from the train station. The sun was shining so we took a stroll down towards the middle of town. Unfortunately we took a route right through the most dodgy area full of abandoned old stone houses, scary looking men on the side of the roads etc. We quickly tried to cut back through to an area which didn’t make the hairs on the back of your neck stand up and came across a nice courtyard in the sun by the old town entrance where we enjoyed lunch in the sun. We then found that the nice area centred along the river which was so dirty it made the Waikato look clean. As it was a Sunday, the boardwalk was packed with people out having a good time. Actually, now that I think about it, the fact that it was a Sunday wouldn’t have made a difference as no one seems to work here anyway. The boardwalk was lined with bars and restaurants full of people. 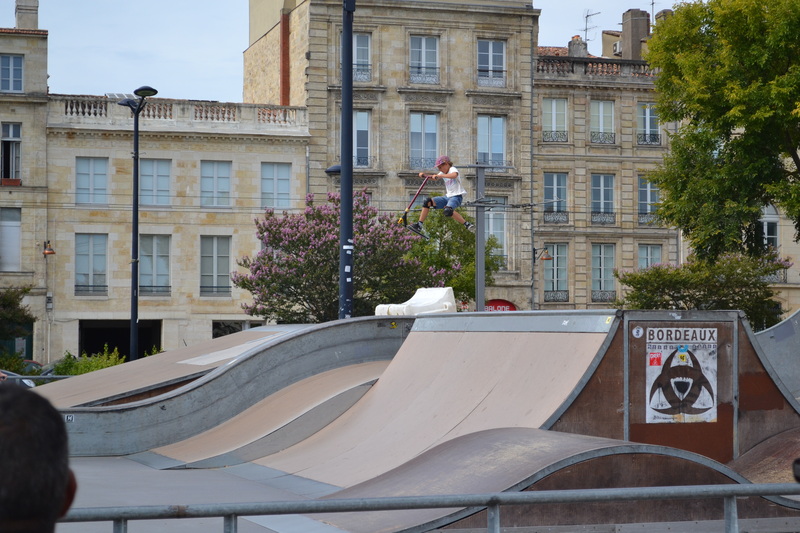 A popular thing in Bordeaux was rollerblading, skateboarding and scootering. We came across a huge skatepark right along side all of the old buildings which had kids of all ages going over the jumps. After walking the length of the boardwalk (which was much much further than we realised), Alex found out that the Manchester United game was playing at 5pm (much more reasonable than 3am) but since we were so tired (and because the area around our hotel was super dodgy – I didn’t want to go out at night), we decided to watch it back at the hotel. Our first day with our brand new Peugeot! A manual 1.2l 208, resplendent in silver. After a detailed lesson in how to drive on French roads from the nice Peugeot guy – “here are the keys, have fun” – we took off. I’d intended to spend a bit of time learning in the parking lot, but unfortunately we took a wrong turn and headed almost immediately onto a main road, which made me learn much quicker. 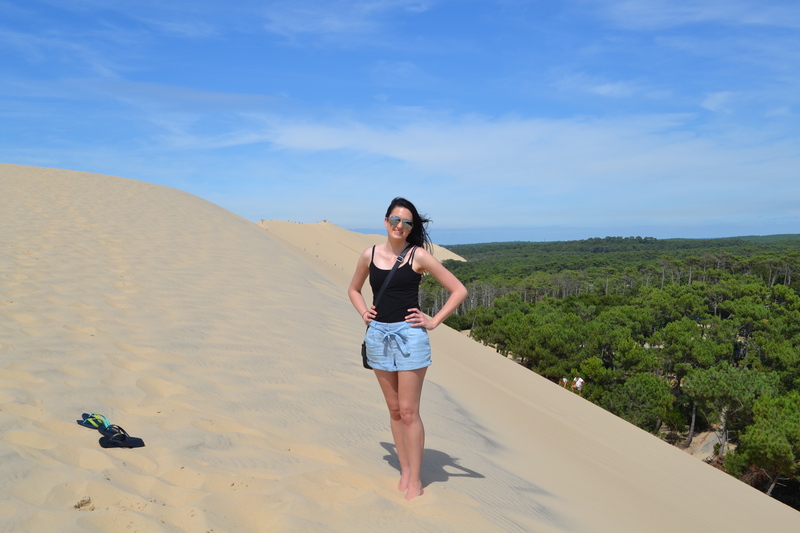 After a trip to IKEA to buy some supplies, which Bridget was very exited about, we headed off south to our main destination for the day – the Dune du Pyla. 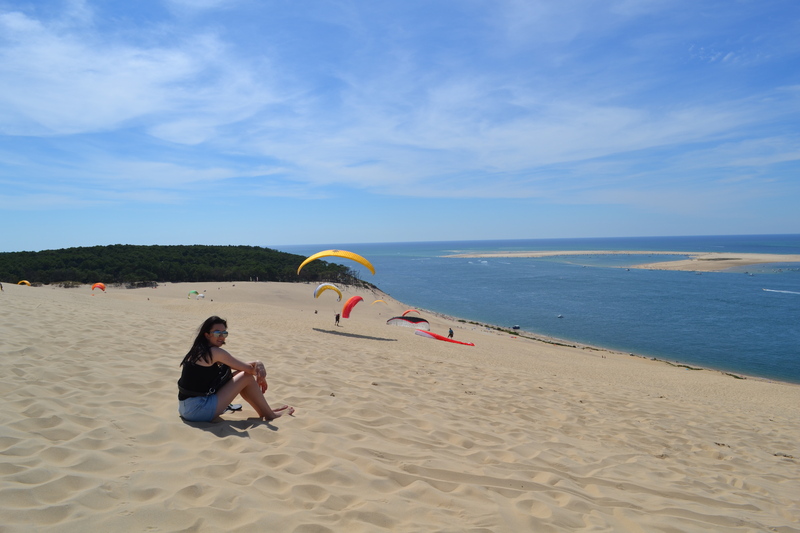 On the coast about 60km southwest of Bordeaux and sandwiched between a pine forest and the ocean, this is the highest sand dune in Europe. I’d thought that this may have been a bit of secret spot, but it turned out that all the French people not working that day, which was everyone, had also gone down to check it out as well, so it was incredibly busy. 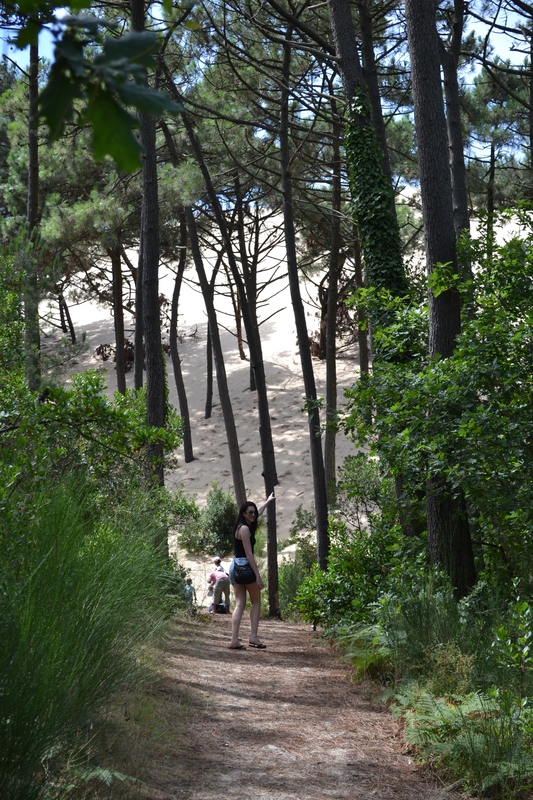 After finding a park and having a car boot picnic, we headed off through the forest to climb the dune. 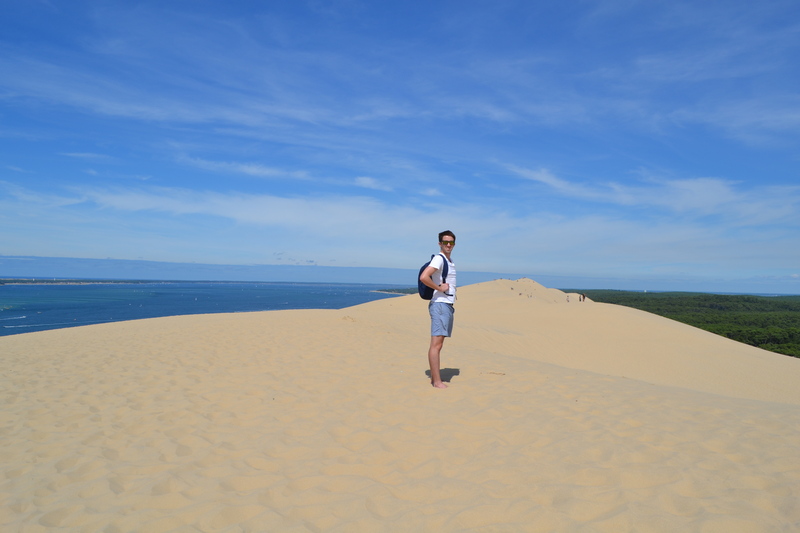 It was literally a case of two steps forward, one sliding backwards, but the views at the top were definitely worth it. After that we cruised back home and crashed out – it had been a big day of nerves on the road and exercise on the sand. Overall impressions of Bordeaux? Mixed. Beautiful in places, totally deserving of the Unesco world heritage label, but also quite dodgy and run down in other parts as well. We had a good time and learned not to stay too near to train stations in the future.